These days, virtually all the churches in the Saints are open to pilgrims and strangers every day, but I can't help recalling the occasion of my first visit back in 1998, in the days before church visiting was such a popular pastime, when I needed to get a key from the local farmhouse. The churchwarden was very enthusiastic. "Of course! What should I do? Do I have to come with you?" "Umm, no, not really", I said. "What do you usually do?" She considered for a moment. "I don't know. I've never given out the key before". And St John the Baptist is still that sort of place; quiet, unassuming, rarely visited. 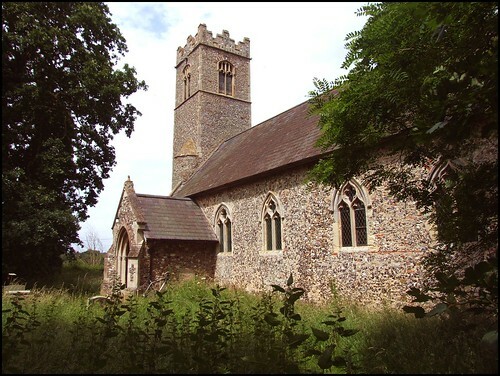 It is a proper old parish church, and if it seems rather neglected, then that is at worst a reflection of how tiny the population of this place is, and at best a sign that this is a thoroughly organic little building, at one with its parish. The tower is a landmark on the busy Bungay to Halesworth road, but I wonder how many people actually stop and take a look inside? St John is best approached from St Andrew, along a deep, narrow lane hemmed in by hedgerows, a rare thing in the Saints. You pass the huge former Rectory, one of those grand Victorian piles that must have seemed faintly obscene in comparison with its humble parish. There's another one at All Saints. All finished with now, of course. Like most in these parts, the churchyard is a designated wildlife area. I fought my way through the nettles to the north of the chuch while investigating some tombchests that had sunk into the ground, and found that I began to do the same myself. The tower is 14th century, and quite unelaborated. The church was mostly renewed in the 19th century, the porch as recently as 1908. Inside, an interesting survival is the cusping on one of the roof braces, probably part of the canopy of honour to the rood. The banner stave locker beneath the tower is one of England's tallest. It is in use again for the processional cross. My favourite things here are the ledger stones. By the south doorway, one tells us that Thomas Coleman lived to a good and vigorous old age, a good example of an Early, Constant and Reverent devotion in God's House of Prayer. It goes on to tell us that he was of true Hospitality and daily Charity, of Paternall Care, wise Conduct and Household Government, of strict Temperance and most unspotted Chastity, and that these were the vertues of his youth and the blessings of his age. However, all good things come to an end, and on 18th February 1695, at the age of 79, under the generall decays of Nature, without sigh or groan, he fell asleep. Up in the sanctuary, a wickedly grinning skull reminds us rather more succinctly that Hodie Mihi, Caras Tibi: 'Mine Today, Tomorrow it's Yours'.